The elevator pitch: A clone murder mystery in space. The heart of Six Wakes is a murder mystery. With that in mind, I don't want to give too much away because part of the fun in a mystery is seeing if you can solve it before someone else gives you the answers. Here are the basic facts: There is a single ship headed into deep space on a mission to colonize a new planet. Travel time is such that the six-man crew must be cloned throughout the journey to extend their lifetime. Typically when a clone wakes, it is with all of the previous clone's memories. However, all six crew members wake up, at the same time, missing decades from their memories and surrounded by their floating murdered clones. One of them is the murderer. Do you have goosebumps yet? I am giddy just thinking about what Mur Lafferty accomplishes with this book. You see, I grew up watching Law & Order, Murder She Wrote, Perry Mason, the A-Team, etc. and Lafferty has managed to seamlessly join genre and mystery elements into this single volume thriller. Lafferty sprinkles clues for both the crew and the reader. Because the crew is missing decades worth of memories, they know virtually nothing about each other so the reader experiences the same suspicions as the crew as we all learn backstories and new information is discovered. I kept thinking I'd figured it out and then BAM! Lafferty would reveal something new, and with new connections made I'd have to rethink my big Scooby-Doo GOTCHA moment. I stayed up into the wee hours reading because I just had to know. More than just who the murderer was, I needed to know who each of the characters were and how they'd ended up where they did. Lafferty made me care about them and want to follow them. It is a page-turner of the best kind. You aren't flying through, skimming passages just to get to the end. You are flying through, soaking up every line wanting more. More of the characters and their world. And when the end final does come there is the satisfaction of finally knowing the 'who dunnit' but also a sadness that you're saying good-bye to this crew you've spent all this time getting to know. 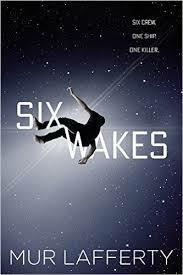 If you're looking for a fresh take on clones, scifi/mystery blends, or a fantastic stay-up-all-night-reading experience, you want to pick up Six Wakes. Nerd Coefficient: 9/10 "a fantastic stay-up-all-night-reading experience"